Yesterday I did what h3as so far been one of the hardest things I have ever had to do in my life. I hugged and kissed three of my four children, told them I loved them and I would miss them terribly, and then I turned around and I walked away. I don't know when I will see them again. I really don't remember that I have ever felt so heartbroken or desolate at going away from them... but I cried most of the flight... and of course, it had to be the one flight I've taken in the past 18 months where I didn't have any of my familiar flight staff, so there were lots of questions, which lead to lots more tears, and generally just a miserable flight in general. Presenting to the Emergency Department in Brisbane was a bit surreal. We weren't kept waiting, the first doctor we got that did the paperwork for our transfer was one that treated Nicola when she was very little, and then we met the oncologist. 24 hours on we are still in some what of a holding pattern. We have seen the oncologists and we have seen the pain doctors and we have seen the surgeon. We have something of an initial plan... we just have to wait for the timing to be able to get everyone together to make it happen. Nicola needs to go into theatre. She needs a central line for IV access, as well as biopsies of the primary mass in her pelvis, her bones and her bone marrow and she needs to have nefrostomy bags put in to drain her kidneys because the tumor has occluded her uretera's completely and her kidneys are under pressure. The bad news is that the tumor is completely unoperable. The sheer size of it and the fact that is impacting on nearly every major organ in her little body means that they cannot safely cut it out. We have to hope that chemotherapy and radiation can shrink it enough to make surgical removal a viable option. But we can't start chemo or radiation until we know exactly what kind of cancer it is that we are dealing with. They are fairly confident that it is a rhabdomyosarcoma, but they need to be certain, and they also need to know how far it has spread. But before we can find any of that out we are waiting for a theater space. It all seems so absolutely surreal. Three days ago we were talking about taking our first real family holiday, trying to get a few days at the beach with our girls, trying to give them a sense of normalcy. Three days ago we were arguing about money and getting our bills paid, what we wanted for dinner, were the girls eating enough veges, and which way was the best route to drive to do the school run. Now, our lives have been turned upside down, inside out and back to front and I don't know which way is which any more. For the last two and a half years, give or take, I have looked back on the day I was given Nicola's diagnosis, and I have often felt like it was about the worst day of my life. My love for my child was never challenged, if anything, it strengthened about a hundred fold in the space of a few words, but with that love came the intense fear. Fear for my child's future, fear for her well being, for her health, for her safety... fear for her life. Over the last two years, that fear has slowly subsided and been replaced with a determination that we would not be beaten. We have faced insurmountable battles and we have triumphed, we have challenged the odds and won. Each new victory bought with it a stronger sense of unbeatableness. Today, I find that feeling of insurmountable unbeatability has not only wavered, but it has been shaken to it's very roots. Today I was told that my daughter most likely has cancer. Over the past couple of months she has become more and more irritable and miserable. Over the last two weeks in particular she has started showing signs of bloating and abdominal distention. We saw her paediatrician last Thursday who did some urgent x-rays, suspecting that she had a blockage or impaction in her bowel. The x-rays showed that there was nothing clearly wrong, so the Doctor ordered an abdominal ultrasound to have a closer look. "10.5cm x 9.0cm x 11.0cm solid mass in the pelvis displaying internal vascularity." They also noted that there is a 2cm solid mass inferior edge of the left lobe of the liver, most likely representative of a node, and solid vascularity material surrounding the gall bladder extending inferior to the liver. We are scheduled for an MRI tomorrow to find more information but they have told me that she will require surgery regardless because the mass is obstructing the flow of urine into her bladder and her kidneys are moderately obstructed. 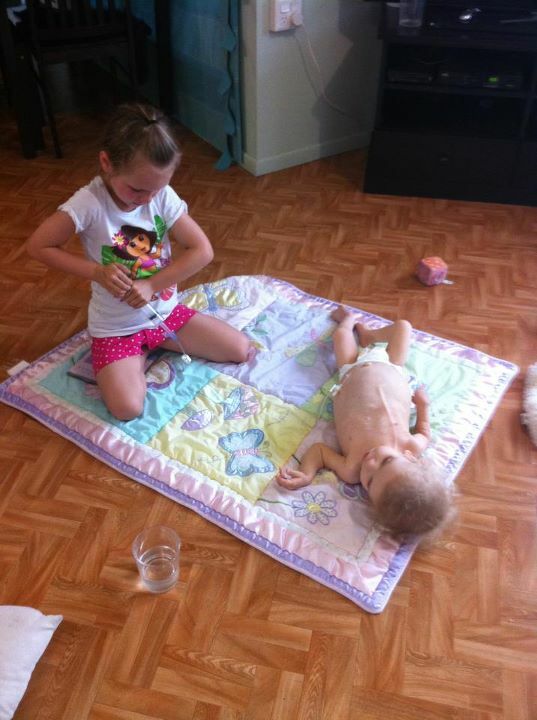 We have been told that because of Nicola's over all condition we have been told to assume cancer until they can prove otherwise, which probably won't be until we get to Brisbane and see oncologists for the surgery, and we're not sure when that will be happening, though we believe they are pushing for it to be pretty quick. All of a sudden I don't feel confident, I don't feel unbeatable, and I certainly don't feel determined or triumphant. I feel lost, alone and empty. I feel cold and numb. My baby, my beautiful, sweet, innocent baby, who has already battled through so much, has a monster growing inside her, a horrible, sinister, deadly monster. I can't fight it. I can't make it go away. The journey ahead is so intense, and that is just finding out what we are dealing with. At the moment I can't even begin to comprehend dealing with chemo and radiation and all of that. It all just feels so completely overwhelming, and I can't process it. All I want is to go to bed, curl up and sleep and wake up with today having never happened. Instead I will smile and pretend. I will pretend to be strong, I will pretend to be brave. I will pretend that everything is going to be just fine, even though deep down inside my heart is breaking. I will hide my fears and I will not cry, I will show strength and courage even though I want to run and hide, and beyond all, I will pray, I will hope, and I will love fiercely. Because other than pray, hope and love, I don't know what else I can do. So after a particularly particular day, I have decided that I would share a few tidbits of my day. After waking about every hour last night, Nicola decided that a great time to start the day was 5.14am. She wanted up, she wanted out of bed, she wanted a clean nappy, she wanted her medicine and she wanted her milk and she wanted them all in that exact order. Except Nicola didn't want to be part of it. It was too hot, to bright and just not what she wanted. So she screamed, so while the rest of the family sat outside, Michael sat inside with Nicola while I cooked and then I sat inside with Nicola while everyone else ate. We decided to take the girls to the duckponds to have a bit of down time. I normally love the duckponds, it's so relaxing and so inviting! There is usually some shade and a lovely breeze and the big girls have a great time throwing bread (that we buy specially because the ducks like soft bread too!) to the ducks, turtles and fish. Except Nicola didn't like it. It was too hot, too bright, too noisy and just not what she wanted. So she screamed. The more she screamed the more Alyssa screamed until the ducks all got scared away. So we gave up, packed up and came home, where, despite her protestations that she was tired and wanted to go to bed, she outright refused to sleep. I turned the blender on to blend her foods, and she screamed. I turned the tv on for her to watch Wiggles and she screamed. I put her on the floor with some toys for a play and she screamed. I put the iPad on for her to play with and she screamed. I went to the loo and she screamed. I talked to her sisters and she screamed. I had so many things I was planning to do today, including mow my yard so my children can play without risking being attacked by a tribe of mysterious pygmy's, and mopping my floor and doing my dishes and trying to tackle the ever rising mountain of washing, but nothing got done. My day ended with my 5 year old sitting outside on the swing crying because I broke a promise to her. I promised her that this afternoon we would play soccer together in the yard, but I couldn't, because Nicola screamed. This has been what a large part of our life is like. She suffers from a mix of chronic idiopathic pain and extreme anxiety, as well as frustration at not being able to express herself and not being able to get involved etc. I do what I can, but I can't do enough and so she screams. She screams all day, she wakes through the night. We don't sleep, we don't relax, we don't get time off, we don't get a break. This is what our life is like. It is relentless, but it is done with love. I have to say, one thing that has come out of having a child with medically complex special needs is that it well and truly shattered my over re-activeness in parenting! I don't think I've ever been really bad, I'm definitely not as bad as some... but now I think, at least when it comes to my 'normal' children, I tend to be pretty laid back. "Really? My kid has a 40 degree fever? Are her toes still twitching? Then she's all good!" I don't tend to over react a whole lot. Yet, Nicola almost always sets my spidey sense twanging. I can't even say twinging because it is so much more than a little twinge, it is a great big resonating twang! Take her most recent little game. She woke last weekend with a bit of a temperature. Nothing too frightening, gave her a bit of panadol and set her down to go about our day... and then it started. Oh My God! She's vomitting!! She is really irritable, I wonder if that's something. She's not sleeping properly. Maybe that's something? Hang on! Why is she even vomiting? She can't vomit! She's had a fundo! 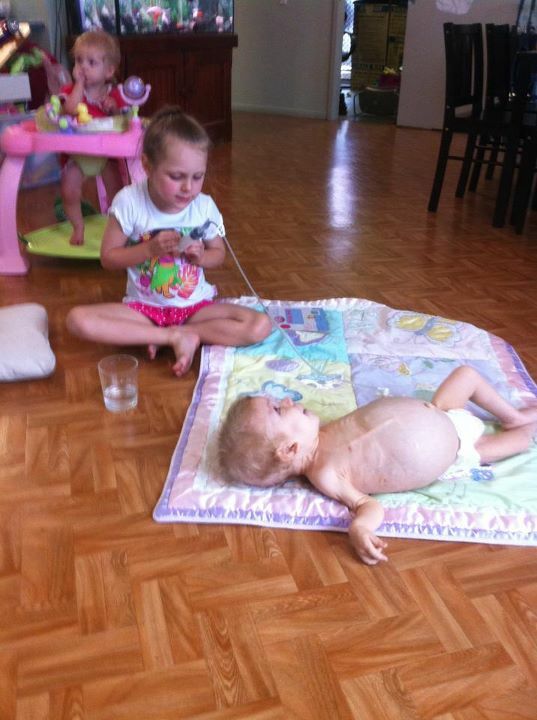 She has a shunt, could it be blocked? She's vomiting and she has a fever. Hang on! She's undone the fundo! That fundo was holding down a hernia! If she's undone the fundo, where is her gut sitting? Does she need surgery for that? So surgery for the fundo and if she keeps going this way likely a hernia repair. She probably needs surgery for the neuro stuff. I can't see any obvious signs of damage to the shunt or blockage. Maybe it's completely malfunctioning! Oh God! Should I phone the neuro surgeons and get them to start organizing tests? Maybe I should phone the paeds? No, it's a weekend, we have to deal with Emergency and they're useless. Tomorrow is Monday, I'll hold off and see if we can wait til tomorrow and talk to her paeds. Oh, never mind, there's the poosplosion! It's just gastro after all! Mind you, this mental conversation takes place over many hours, but still, it kind of gives you a bit of an idea. A week later, my spidey sense is still twanging, but for a whole range of different reasons... I've spent ages trying to figure out why I seem to have a permanent headache, I have blamed my children, my husband, too much chocolate, not enough chocolate, too much caffeine, not enough caffeine, heat, sunlight, and a million other things, but it seems that all along, it's just my own spidey sense twanging away in the recesses of my mind, making it's presence always known. Now if I could just find a way to silence it!!! This afternoon my 5 year old, Jessica, proved to me how exceptional she truly is. I decided to get out and mow the back yard to try and keep the damn nut grass at bay. While I was out there, I told Jessica that she was in charge of the babies. She likes to get a bit of responsibility, it makes her feel important, and I like giving her the boost. I was only outside for maybe about 40 minutes, if that, and I checked on them all several times. They were quite happy watching Dora on tv. But when I came back in after putting the mower away, I couldn't help but smile at the sight that greeted me. Jessica had decided that Nicola was thirsty and wanted some water... so by herself, she went and got a cup of water, a syringe and a tube. 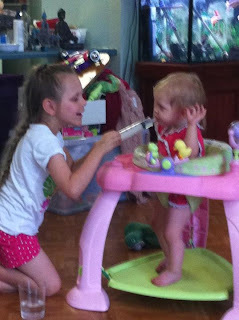 She plugged the tube into Nicola's Mic-Key port, drew up a syringe full of water and started to give her sister water. Nicola clearly wasn't in the least bit phased by it. I was so proud of Jessica for being so thoughtful and so kind and so considerate, but it didn't end there! When Nicola signed that she was finished, there was still water in the cup, so Jessica decided that Alyssa was thirsty too! I have often joked that I am just about part of the furniture when it comes to the airport lounges in Brisbane and Townsville, but today it became startlingly apparent exactly how accurate that joke has become! So, lets start the day of a Frequent Flying Tragic at 3.45am when I crawled out of bed, much to my disgust, in order to meet my 5am deadline for checking in. Finally get out of my front door at 4.50am to walk to the airport... a walk that usually only takes me just under 10 minutes if I take my time. I had barely gotten on to the main road and a car pulled over asking me and a voice calls out asking me if Nicola and I would like a lift. It was a flight attendant that we often see on our flights. I politely declined and said that we would be fine, I was quite enjoying the walk. A second flight attendant pulled over and asked me about 2 minutes later. We got to the airport, the security guard in the car park knew me by name and said good morning. The staff on the check in desk knew my by name and knew Nicola's exact needs. They pulled me out of the queue and let me through straight away. The security staff knew us both by name, knew to be mindful of Nicola's stoma and her button and knew that she doesn't like strangers and they had to be quick. The flight attendants on the flight knew us, the captain knew us and the special assistance team knew us. When we landed in Brisbane, the special assistance guys knew that it was us before we even got off the plane... How? They recognised Nicola's wheelchair. I realised after I had left the airport that in many ways I have started to form pseudo friendships with these people. One of the special assistance guys in Brisbane, his wife is due to have a baby in 21 days. I have known since she was about 11 weeks. Every time I go down he tells me the latest updates... and I know that next time I go down he'll have a photo to show me. By some stroke of luck I ended up with our 'regular' taxi driver, even without calling him to tell him we were flying in. When we were through, I decided that rather than go shopping or wasting time in the city I would just hop back to the airport... the Customer Service Manager of the airline recognised me when I was lined up and pulled me out and was even nice enough to find me seats on an earlier flight so that I didn't have to sit around for another 6 hours in the airport waiting to return home. They boarded us early again so we had time to settle Nicola before the rest of the passengers boarded. And, that was when the real fun began! Now, I suppose I really should stress that the next part of this tragic tale is definitely not normal fare. We were given the wrong information... or, rather, we weren't advised of the gate change until they went looking for us to board us early. Our flight was changed to gate 20, I was waiting at gate 1 where they told me to be. We do a mad dash through the airport and get out to the gate. They take us straight down and put us in our seats and take Nicola's wheelchair and stow it in the cargo hold. They started to board other passengers... about a quarter of the way through, the airport sirens start to sound. The airport has been locked down for severe storm warnings. The planes can't fly. Everyone has to get OFF the plane and head back into the lounge to wait. Because they've taken Nicola's chair, we can't get off the plane, so we sit there, waiting. The airport is locked down for about 30 minutes before they finally clear the severe weather warning and start boarding passengers again. Finally, everyone gets boarded and then they announce that because the airport was locked down at 2pm, which is when the industrial action kicked in and all the baggage handlers went on strike, there was no one to load our luggage into the plane and we couldn't take off without the luggage. Another 45 minutes later and they finally get things loaded up and we can depart, but by that point we have to compete for space on the runway and end up having to taxi to the furtherest runway and take off from there. So the flight that was supposed to depart at 13.55 ended up departing at around 15.00. By which point Nicola had been sitting in the plane for about an hour and a half and was utterly over it, so naturally that set her up to be cranky and she screamed the whole flight home. All I can say is that I don't know who was happier to see her bed... her or me! Still, at least another trip is over and done with. Hopefully we will get a bit more of a break before we go down for the next one!